We are among the trusted names engaged in manufacturing, exporting a broad range of Refrigerated Dryers. These products are designed under the able guidance and expertise of our professionals and are manufactured using premium quality raw material which is obtained from trusted and reliable vendors of the industry. Furthermore, we make sure to examine the quality and working efficiency of these products in order to ensure their compliance with international quality standards. Clients can avail from us, a wide and exclusive range of Refrigerated Air Dryer. These products are manufactured using a supreme quality raw material, obtained from authorized vendors of the industry. In addition to this, these products are made available to the customers in varied specifications, in order to serve them in a suitable manner. Furthermore, we examine the working efficiency of the entire range before delivering these products to the clients end, in order to ensure their functional efficiency. Panel display with the entire operation for higher nodes. Efficient automatic draining with bypass. Assured after sales service with spares supply indigenously available. 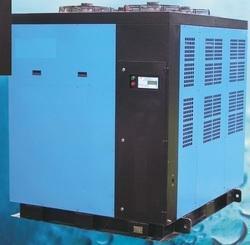 We are counted among the leading industries engaged in offering a wide range of Refrigerated Air Drying Unit. These products are manufactured using qualitative raw material which is obtained from authentic vendors of the industry. Our professionals design these units in compliance with international quality standards with the help of the latest amenities, in order to ensure their supreme quality and efficient performance. • Compact and Suitable for Indian atmospheric conditions. • Complete dryer operation overview through front panel display. • Inlet/outlet digital Compressed air temp indication as an option. 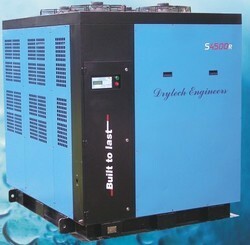 • Adopted environment-friendly refrigerant system. • Reliable, automatic drain valve with bypass arrangement. • Compact design with the maintenance-friendly workmanship. Looking for Refrigerated Dryers ?